Failing to keep up with the monthly bills can create enormous pressure on a family. Creditors will often harass borrowers, file lawsuits, and take other aggressive action to try and collect a debt. Florida Law Advisers, P.A. is dedicated to helping families and individuals solve their financial problems and end creditor harassment. 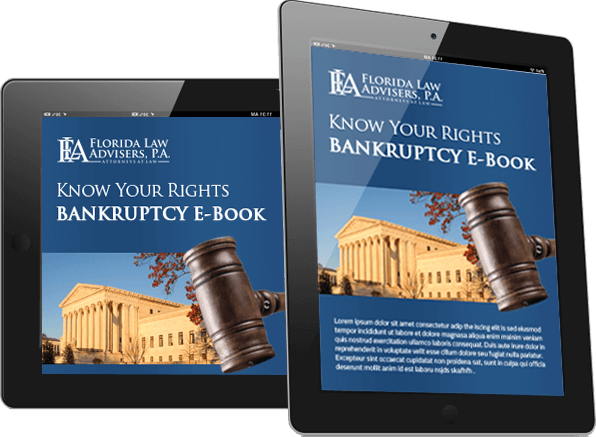 Some Tampa bankruptcy attorneys will say that bankruptcy is the only solution because that is the more profitable option for their own law firm. At Florida Law Advisers, P.A. helping our clients is our primary goal and we provide you with information on many different ways to solve your debt crisis. We develop comprehensive strategies based on each client’s particular circumstances to help provide long-term solutions. Bankruptcy is a great tool for borrowers falling behind on their bills but it is not the only option, and sometimes other debt relief measures are more effective than bankruptcy. Some lenders may try exploiting your situation to earn a large profit at your expense. Debt consolidation loans can have high origination fees and other hidden costs. Also, some debt consolidation loans will have a variable interest rate. Variable rates are good when interest rates in the economy are low; however, the rate can rise very quickly, with little notice, and drastically increase your required payment. Debt consolidation lenders also typically require borrowers to give collateral for the loan. The most common type of collateral in debt consolidation loans is the borrower’s home. In order to use the home as collateral the home must be worth more than the debt consolidation loan and any other mortgage on the property. With the recent drop in home prices, most homeowner’s looking for debt consolidation loans will not have enough equity in the property to qualify for the loan. Our initial consultation is free and we offer flexible payment options to all of our clients. At Florida law Advisers, P.A. we strive to provide you with solutions, not add to your financial burden. We accept many forms of payment and offer our bankruptcy clients the choice of either a low cost flat fee or low cost hourly fee for bankruptcy representation. Contact us today by phone, email, website form, or website chat to schedule your free consultation with a debt relief attorney at Florida Law Advisers, P.A.